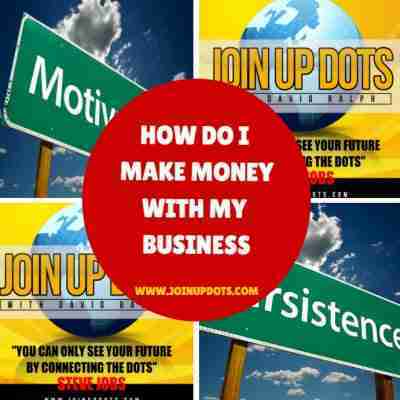 How Do I Monetize A Business? Welcome to todays episode of Join Up Dots which is a solo show where your host David Ralph answers a series of questions that has been sent to the show by the listeners. So lets start with the first question…..
First of all, I just wanted to say how much I am loving the podcast! It helped me exit the corporate career and into this fun and crazy world of start ups. I listen to one podcast every afternoon and it is the perfect inspiration when I start to feel lost and have doubts. Thank you. Advice please – I won’t go into details, but I am working on a business that people love the concept, but it’s hard to see how I can monetize it. It makes me want to stop and go back to my traditional job as a real estate but my gut says that if I persist the money may just come in ways I don’t know exist at the moment. As your show tells us every podcast ‘you can’t connect can’t connect the dots looking forward; you can only connect them looking backward’. So should I just soldier on without a concrete strategy for monitizing the idea or should I work it out before moving forward? Your podcast is so great and matches where my life is headed. I’m excited that you’re podcast is a part of my journey. You have so many podcasts and I’m new to changing my mindset. Which of your podcasts should I start with? Also, the Ultra Running podcast is missing the Jim Carrey quote, it’s just silent. Hello David and the Join Up Dots team. Wow what an amazing show. Thank you so much thank you so much, thank you so much. I have been listening now for the last few weeks and I am astonished by your energy are you always like this or is it just for the show? Would you be kind enough to answer a question that has been bothering me over the last few weeks? You talked about taking the leap, you talk about finding the things that you want to do, and you’ve been talking very much about how you managed to do it. Love the show I would love to know what has been the greatest business idea that you have heard on the show? Could you point out one that you thought was mind blowing?